Beautiful in The Farm at San Benito. 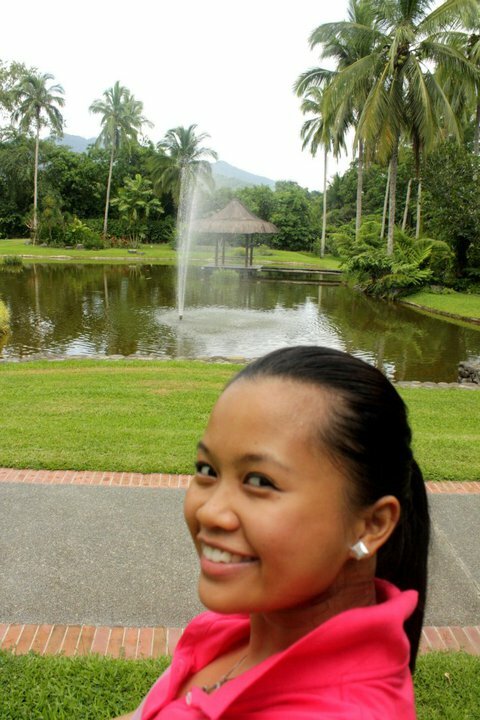 It seems like I traveled back in time when I stepped in the town of Taal in the province of Batangas. Aside from its very beautiful Church that stood strong for a long time, I am listing my few unconventional favorites in Taal! 1. I like these hair brushes, hair pins and mirrors from so-long-time-ago! I feel like there are some magical powers that will make my hair shiny and bouncy! You’ll see them as you visit the ancestral houses together with beautiful vintage luggage! 2. I wonder why this eyeglasses is not in the market now, seems like a specialty to me. 3. For the growing passion in photography among us, Filipinos, you might want to visit the impressive collection in their Camera Museum! 4. Of course, the rumor is true! You can dress up and live like an Illustrado in the Spanish era at Villa Tortuga! I like the hospitality of everyone who serves the local food while wearing Filipiniana and the extensive knowledge on Philippine History of the great Camp Suki designer, Lito Perez. 5. Looks like a portrait? This is my favorite placemat in Villa Tortuga. It portrays the old Manila. Manila would be so beautiful with people walking around in “saya!” I think this placemat is also for sale! 6. Among all the things that I’ve discovered as we check out the museums and ancestral houses, this is my most favorite. I flew back in time as I looked down the hole and imagined how Andres Bonifacio and several other Katipunan heroes conducted their meetings there with a gas lamp as their only light. I could imagine how passionate these people were in bringing the democracy to the Filipinos. 7. But the most memorable food I had was the Tsokolate Eh which is a thick and rich chocolate drink which used to be a status symbol among affluent Spaniards and Filipinos during the Spanish Colonial era. 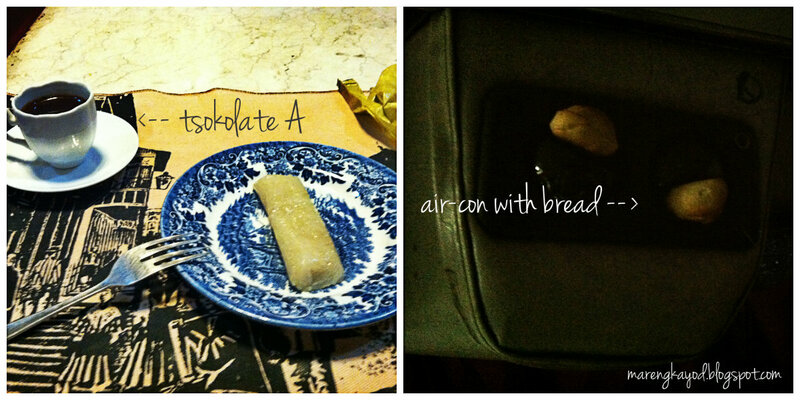 It was matched with suman, a native rice cake wrapped in banana leaf. Taku and I always joke around that it will just be Tsokolate Ah for us, a lighter and watery chocolate drink that is good for sharing for everybody! The Taal fun continues as you ride the cold bus on the way to Manila. We were feeling sick with too much coldness because it was a rainy day when we visited and he tried to tie the curtain over the aircon but the most successful technique was to put some old breads in it, doesn’t look good but helpful. haha. PS. Don’t forget to buy tablea and balisong! Seeing the photos of last year’s visit at The Farm at San Benito made my Saturday so serene and hopeful. 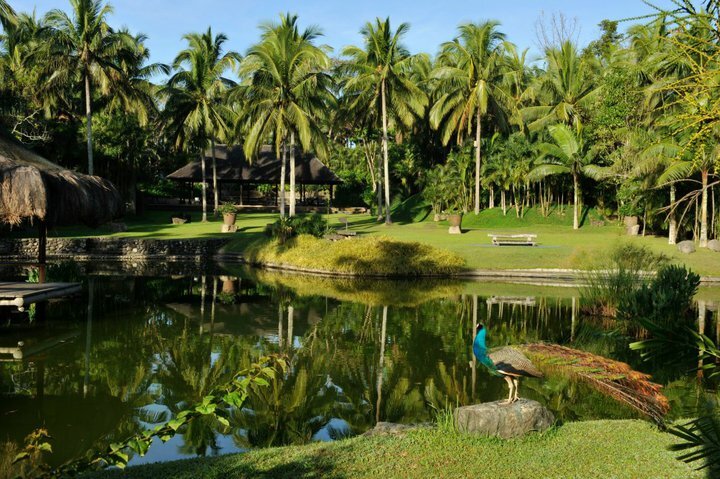 Known for its Detoxification Retreats and Wellness Programs, The Farm at San Benito, in Lipa, Batangas, Philippines is an award-winning health resort located an easy 90-minute drive south of Manila. It was a wonderful Saturday when I went there. As a yoga-lover, I felt the sense of belongingness in the place. The peace seemed to be from within; I breathed carelessly feeling that no polluted air will ever enter in my system. this is the only thing I was seeing during the spa very relaxing treatment. Spa and massage is part of my month! I’m having it twice a month and experiencing the spa treatment at The Farm was a very overwhelming experience. Everything that they used in my body was “edible” because they believe that we should be fair to our skin, being the biggest organ of our body, and give what it deserves with the same vitamins and minerals that we give to the rest of our body! 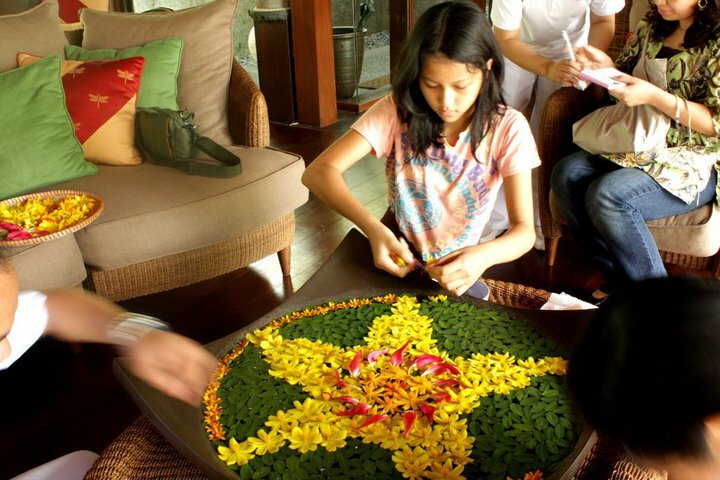 kids will definitely learn the art of flower arrangement and decoration! Am I just pasted? or just completely wasted? I had their Alive! 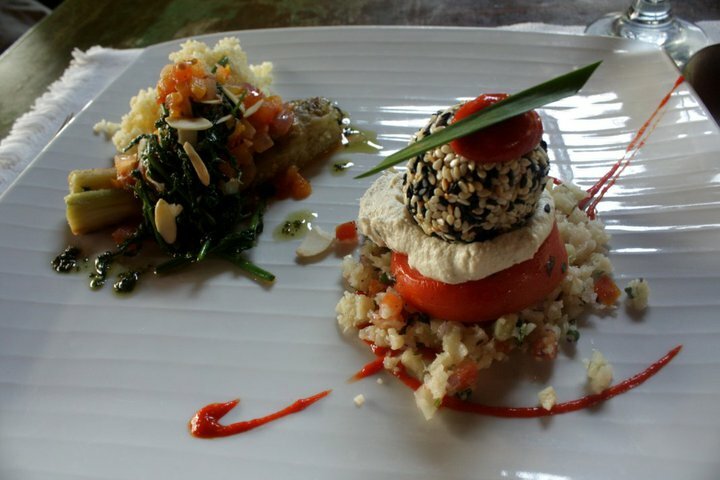 Vegetarian 5-course Lunch. I wasn’t able to talk the whole time I was eating. I was the best Zucchini with Basil Soup ever! Everything was so lip-smacking and thinking about how they grew every ingredient of what I was eating and what they used in my body for massage was so astonishing and admirable. 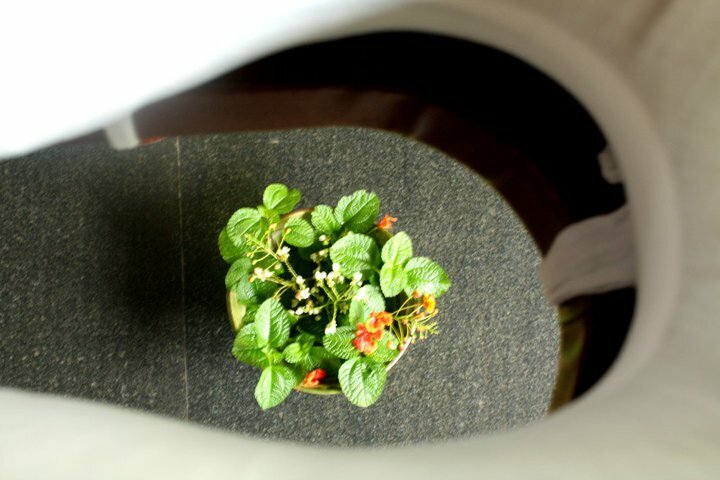 “We believe in the body’s inherent ability to heal and maintain a healthy functioning state. 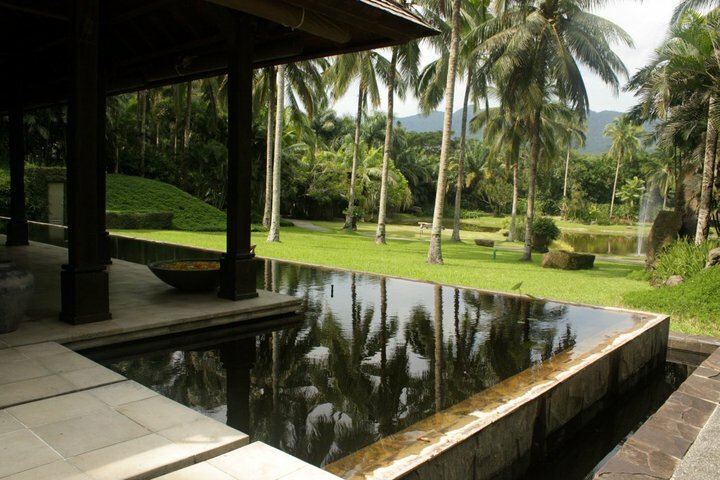 Having won 18 international spa industry awards since 2004, The Farm has served as an inspiration to the Philippine tourism industry and benchmark for local spas in the country. It was awarded with the prestigious Asia Spa Award for Best Cuisine of the Year 2010. In 2009, CNN Traveller showcased the resort as one of the world’s best green places to stay in CNN Traveller’s list of Six Best Environmentally Friendly Hotels in the world. 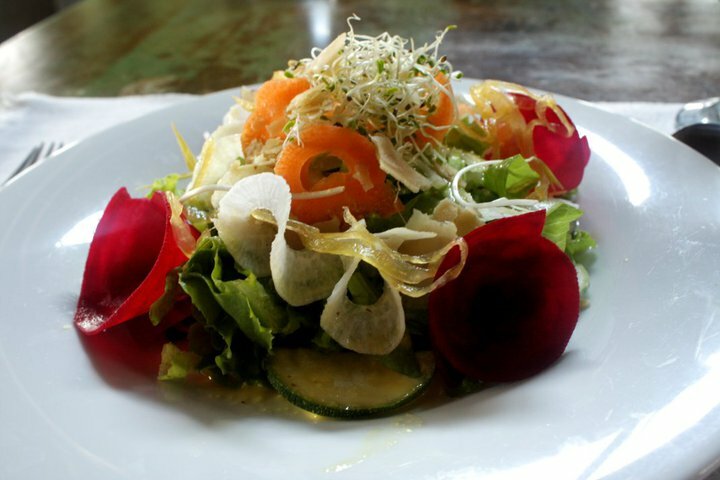 Its experienced team of integrated medical doctors, nurturing spa therapists, body-mind-spirit activity consultants, and “living food” chefs together with holistic approach to health has made The Farm one of the leading wellness destinations in the region. Don’t forget to visit The Farm at San Benito when you visit The Philippines and have a healing journey! At any time, you may request assistance for transportation or any other by calling the following numbers: 02-884-8074 (as to be dialed within the Philippines) +63-2-884-8074 (as to be dialed from outside the Philippines). You can also ask for assistance from iMarketing Japan, Inc & Philippine Primer Magazine at 7th Flr. Maripola Bldg. 109 Perea St. Legaspi Village, Makati City, or call +63.2.836.8381/ +63.2.808.2163. It was a #GoodFriday, indeed! After Visita Iglesia and Station of the Cross, we were all ready for our final station— dinner! THEN after a few minutes... Above the hawker center was an old man shouting “Help me! Help me!” We all looked for him and found out that he was holding either a side of his side or his ear tightly, full of blood. Without hesitation, Ate @rizalinavillano and Ate @rochellecapanzana rushed to his house to give him the best first aid/care. Without hesitation, they told the police “We can help, We’re nurses.” They then saw a 93-year old man soaked in his own blood (even on the floor), locked alone in his house, very scared and thinking he’s gonna die. We were so grateful of these women. We were so proud of their big hearts. Tonight, may we all remember Jesus’ love and sacrifices for us, and with this memory, we’ll forever be a blessing to others no matter how difficult it may seem to stretch our hands to help others. Have a blessed weekend, everyone! #GoldenHeartAwardees We know that the gift they want is @salonpas_singapore cause they always have muscle pains. Haha. PS. Please don’t leave your old fellas or grandparents alone, show them your love while they’re still with you. Nakakaloka. Who doesn’t love Open-Air Cinema? Stories, photos and views on this blog are all mine, unless stated otherwise. I make no representation as to the accuracy or completeness on any information here or found by following any link on the site. Also, I cannot guarantee the completeness, accuracy, honesty or even politeness of the comments. But since this blog is made to remind me of the wonderful life I’m living, I guarantee you my honesty in every post. Have fun!